Included in the full itinerary today at Used Car Week is the in-person recognition for the respective winners of three awards programs previously announced in Auto Remarketing magazine. Cherokee Media Group is proud to announce two speakers already lined up for its 2018 inaugural Automotive Intelligence Summit (AIS), which will be held July 24-26, 2018 at the Raleigh Marriott Crabtree Valley in Raleigh, N.C.
“The Automotive Intelligence Summit was created to be a foundation to foster a high-level meeting of the minds,” said Bill Zadeits, president of Cherokee Media Group. “Having industry experts like Maryann Keller and Lonnie Miller on board is the most promising of starts toward achieving exactly that. “Their respective experience and in-depth knowledge of the automotive industry sets the table for the type of educational content AIS 2018 has in store,” Zadeits said. Keller has been in the auto industry for more than 40 years, including nearly three decades as a Wall Street analyst. She launched Maryann Keller & Associates in 2001 and is its principal. Keller has held board of directors positions with Dollar Thrifty, Lithia Motors, Falcon Financial and Sonic Automotive, in addition to her current board of director posts at AutoCanada, DriveTime and Lee Auto Group. She was also on National Research Council panel from 1992-2001. At SAS, Miller focuses on market opportunities and risks with emerging technology and competitive market dynamics in the auto industry while advising how to leverage analytical approaches to improve connected vehicle, smart mobility and customer experience strategies. Prior to joining SAS, Lonnie held a variety of senior leadership roles with R. L. Polk & Co. (now IHS Markit). This included leading company’s Loyalty Management Practice, their Marketing and Industry Analysis unit and the company’s Analytical Solutions team. For more information on AIS as the itinerary continues to develop, visit AutoIntelSummit.com and sign up to receive updates. AIS 2018 is delivering the opportunity to connect with leading minds who are involved within the automotive, auto finance and transportation-related industries. The event is an executive-level meeting designed for C-suite leaders who desire access to the best intelligence, data and analysis available. “AIS ’18 will focus on content and intel in areas where we are strongest- in the dynamic used car and auto finance markets and will look beyond those core areas to enhance and grow in sectors critical to executives at the top level of the OEM’s, dealerships, banks, finance companies, fleet, lease, rental, suppliers and more,” said Zadeits. As an aggregator of the top industry minds, AIS 2018 will provide attendees an experience packed with powerful insights, information and knowledge that can make a significant impact on their business planning and success. AIS 2018 organizers are leveraging experience and relationships from a wide swath of the automotive, financial and technology sectors to deliver a unique, three-day event that will give attendees a better understanding not only of what’s happening now, but also what’s ahead to keep you and your firm ahead of the technological curve. What’s new at Used Car Week? Flashback with me for a second. It’s the first day of the fall semester at college. For the freshmen and transfer students, it’s a brand new environment and perhaps a brand new experience altogether. For the sophomores, juniors and seniors, the start of a semester may be old hat. But there are still new classes, new classmates, new lessons to learn, new memories to make and more fun to be had. Well, Used Car Week is sort of like that. Except no pop quizzes, and we stay in hotels instead of dorms. But nonetheless, each Used Car Week is a fresh start, no matter how many times you have attended the event (even for us organizers). Each year brings a new twist. For this year’s highlights, see below. After Used Car Week 2016, our conference team analyzed data from post-event surveys and chatted with participants one-on-one. What that uncovered was a need to expand the auto finance and repossessions topics, and adjust the certified pre-owned conference into a more comprehensive picture of the entire retail used-car market. We hope the new and improved format will provide you with a more valuable experience. The conference will now be split into two blocks. The first will consist of the Pre-Owned Con, the Auto Fin Con and the Repo Con. The second will be National Remarketing Conference and NAAA Convention. Participants will have the opportunity to attend either 1st Block, 2nd Block or both with an All Access registration. If you are a 1st-Block participant and want to attend a Pre-Owned Con workshop in the morning and an Auto Fin Con workshop in the afternoon, go for it. One addition you might notice in the agenda is that some (but not all) of the breaks between sessions are 45 minutes instead of 15. This is designed to give attendees a bit more time to explore the expo hall, talk with exhibitors and spend some time networking. After all, in addition to the great educational sessions and awards, one of the big benefi ts of Used Car Week is the chance to gather with your peers and meet some new business contacts. This year’s location for Used Car Week — The La Quinta Resort & Club — promises to make you stop to smell the flowers and take in the spectacular view of the Santa Rosa Mountains. We hope that in between educational sessions and networking events you’ll find some time to enjoy this gorgeous oasis in the desert. The resort has a campus-like set-up, rather than one set hotel building. It’s also the first time Used Car Week has been held at this location. Also making their debut this year are the Used Car Awards (UCAs). The UCAs will honor the dealers and executives making positive impacts and building great businesses within the used-car industry. Awards that have traditionally been a part of the event and some relative newcomers will all be part of the new UCA luncheon. New awards will also be a part of this combined effort on the part of Auto Remarketing, SubPrime Auto Finance News and other Cherokee Media Group brands. The Used Car Awards will be presented during a luncheon sponsored by TradeRev during the First Block of Used Car Week on Tuesday. Additional industry recognition and awards such as the Auto Remarketing Under 40, Women in Remarketing, Lifetime Achievement and the National Remarketing Executive of the Year will still be presented during the NRC/NAAA (Second Block) portion of the week. All of the award winners and honorees during Used Car Week will be highlighted in a special December “Used Car Awards” edition of Auto Remarketing. Hiring for the Future: The search for authenticity Nov. 16, 2:45 p.m. The panel will feature conversation focused on trends in recruiting and working in remarketing as the industry becomes increasingly technology-driven, the role of mentoring and developing women into industry leaders. The dialogue will also explore the impact of changing demographics. For complete information on Used Car Week, visit UsedCarWeek.biz or download the Used Car Week app for your smartphone. Read more about What’s new at Used Car Week? Barrett-Jackson recently raised $1 million for Las Vegas first responders during its 10th annual Las Vegas Auction at the Mandalay Bay Resort and Casino. The five charity vehicles featured in the sale included a rare 2007 Ford Shelby GT500 Super Snake owned by Barrett-Jackson president Steve Davis, which sold for $1 million, according to Barrett-Jackson. The 1 million will benefit Las Vegas first responders through the Injured Police Officers Fund. The organization’s mission is to help lessen the financial burden suffered by first responders, trauma personnel, nurses, police officers and their families in the event of a line of duty injury or death. “Our hearts go out to the hundreds of families and friends who were victims in October 1st Las Vegas mass shooting,” said Minddie Lloyd, executive director of the Injured Police Officers Fund. “These were our fellow Nevadans, our friends. Like the rest of the world, we mourn with you. In the face of this tragedy, there was so much courage: From first responders charging into the middle of the chaos to everyday citizens who helped remove and get the wounded to emergency care. “We may never fully understand in this life why we face tragedies of sorrow, pain and suffering; at least over 500 people injured, and 58 innocent lives lost. But it is important to know that we trust in our community and Steve Davis and Barrett-Jackson. From The Injured Police Officers Fund please know we will be by your side. Nevada will not fail you,” she went on to say. The winning bidder of the 2007 Ford Shelby GT500 Super Snake is Paulette Carpoff, chief operating officer of DC Solar. “DC Solar is proud to be a part of the Las Vegas community. We want the first responders to know, especially in the wake of the recent tragedy, that we stand with you and we are proud to help however we can,” Carpoff said. One of the most important events hosted by the National Independent Automobile Dealers Association starts today with a new name and the organization’s most ambitious goals ever. A record number of independent dealers from across the nation are converging on the nation’s capital for the National Policy Conference and Day on Capitol Hill — formerly known as the National Leadership Conference — NIADA’s annual opportunity to meet face-to-face with legislators and regulators. The event, which runs through Wednesday, was renamed this year to reflect its overriding mission — making the voice of the independent dealer and small business heard and represented in shaping the policies of the federal government. As in the past, the highlight is Wednesday's Day on Capitol Hill, when more than 180 dealers and industry partners representing the national association and its various state affiliates will participate in more than 100 meetings with members of Congress or their staff, advocating for the industry in support of tax reform, reforming the Consumer Financial Protection Bureau and repealing the CFPB’s arbitration rule, and against a blanket ban on sales of recalled vehicles by independent dealers. Both of those numbers will be the most ever for NIADA's Washington conference. In addition, NIADA will present its inaugural Legislator of the Year award at a reception Tuesday night at the Dupont Circle Hotel in Washington D.C. Legislators expected to attend include Rep. Jodey Arrington (R-Texas), Rep. Robert Pittenger (R-N.C.), Rep. Scott Tipton (R-Colo.) and Rep. Roger Williams (R-Texas). Afterward, the PAC Cup will be awarded to the NIADA region that contributed the most to the NIADA Political Action Committee over the past year. Sen. Richard Shelby (R-Ala.) will be the featured speaker for Wednesday’s Power Lunch during the Day on the Hill. The conference also includes a series of regulatory briefings Tuesday, including updates from the CFPB, the Federal Trade Commission, the Small Business Administration and, for the first time, the White House. D.J. Gribbin of the National Economic Council and deputy chief of staff Rick Dearborn are the scheduled speakers from the White House. “NIADA is engaged in the legislative and regulatory process at the federal level year round,” NIADA chief executive officer Steve Jordan said. “That’s one of the association’s highest priorities. The National Policy Conference is the centerpiece of our efforts to serve as advocates for our members and the used vehicle industry. “Four years ago, we felt it was important to come back to Washington D.C. and let independent dealers talk to legislators firsthand about who we are, what we do and what we represent. It’s very exciting to see this event grow, but we've only scratched the surface of its potential,” Jordan went on to say. Want to show off your auction photos in our NAAA issue? The National Auto Auction Association Convention — which is held in partnership with the National Remarketing Conference at Used Car Week — is just around the corner. And Auto Remarketing is celebrating the annual event and the auction industry with our yearly NAAA Convention issue. One of the special sections in that magazine (our Nov. 1 edition) is the annual “Auction Life” photo spread, where we invite NAAA-member auctions to submit photos of daily auction life from the past year. If you and your auction(s) would like to participate, please have photo submissions emailed to Auto Remarketing staff writer Chris Hart-Williams at chwillams@cherokeemediagroup.com no later than 5 p.m. (EST) on Oct. 2. If you are sending large or multiple pictures, a zip file or a photo-sharing site might work better. An additional option is to upload them to our parent company's website. Either way you send them, we need to receive them by 5 p.m. (ET) Oct. 2. Please send captions, if they are available, as well. And while we strongly encourage these photo submissions, we won’t be able to print every photo. However, as a bonus, we will also be running some photos in our digital version of the magazine as an Online Extra. Thank you, and see you in California for the convention! Read more about Want to show off your auction photos in our NAAA issue? While NADA Show 2018 takes place during the height of college basketball’s March Madness championship run, one of its five keynote speakers has a few rings of his own from the college football world. On Thursday, the National Automobile Dealers Association announced the keynote speakers for its annual convention, and Alabama football coach Nick Saban is among the quintet. And appropriately enough, Saban has been involved in dealership ownership, so he will know his audience well. “In addition to the keynote speakers, the NADA Show offers one of the best educational training and networking opportunities in the industry for both dealers and their managers — from participating in the workshop sessions covering all dealership departments, attending the dealer-franchise meetings to shopping for the latest products and services from hundreds of exhibitors," said Richard Stephens, NADA Show committee chairman, in a news release. “Attendees will be among the first in the industry to find out what's new in the retail-auto industry and stay ahead of the competition,” he said. Dealers and dealership managers can begin registering online Oct. 2. That includes an early-bird discount (which ends Nov. 17) an hotel selection. For more information, visit www.nadashow.org. Auction Academy’s largest class, class group 5, traveled to Spokane, Wash., this summer for training held in conjunction with McConkey Auction Group’s Rock & Roll sale at its DAA Northwest location in July. In addition to enjoying the concert event headlined by the Lynyrd Skynyrd Band, during their two days of training, the Auction Academy said the class also saw first-hand how much work and preparation goes into the large event. Following a tour of DAA Northwest, on day one, students sat for lectures on branding, marketing and promotional events by the auction’s senior vice president of operations Greg Mahugh and vice president of marketing Mitzi VanVoorhis, followed by a presentation by AuctionEDGE chief executive officer Dan Diedrich. “The Auction Academy sessions are well organized and executed, and I was impressed that DAA Northwest’s department managers conducted many of the training sessions,” said Matt Fetter, co-owner of Clark County Auto Auction and current Academy student. “Auction Academy has developed a tremendous learning environment with onsite auction visits reinforcing the discussion topics. Not only did we learn from the experts during our session in Spokane, but we had a unique opportunity to see it all in action at a top-tier auction facility,” he continued. Training on day two included meetings with Dave Woods, head of remarketing for Harley Davidson, Gonzaga University professor Shann Ferch who led a discussion on effective leadership and Mike Antich of Bobit Business Media, who spoke to students about the do’s and don’ts of attending industry trade conferences. “Being on-site during DAA Northwest’s Rock & Roll sale was a tremendous experience for all of us,” Penny Wanna, the president of Auction Academy, added. This month, Auction Academy’s year will close with a trip to Baltimore for two days of training with class 5 beginning on Sept. 25. The Academy said the visit will include a full day at NADA headquarters, followed by a day with BSC America’s president R. Charles Nichols and his team at the all-new Bel Air facility. Many young professionals are taking leadership roles in the auto industry and impacting the remarketing and used-car business. In Year 3 of Auto Remarketing’s annual Remarketing & Used-Car Industry’s 40 Under 40, you will find the current- and next-generation leaders of the business who are making big differences in the industry and at their respective companies. Auto Remarketing is honored and thrilled to recognize these folks and celebrate their accomplishments. And be sure you don’t miss the special ceremony at Used Car Week to recognize this year’s group of honorees. More on that can be found at www.usedcarweek. biz. 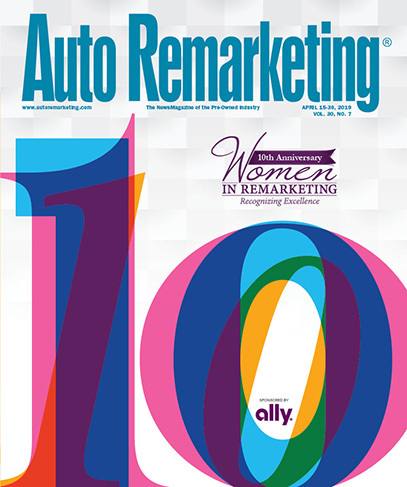 Auto Remarketing would also like to thank everyone for nominating dozens and dozens of outstanding folks. This group represents just a fraction of the incredible young leaders this industry has to offer. We look forward to many more years of honoring these change-makers. Aaron McConkey, Product Director, Auction Edge Inc.
Renee Perri, Vice President of Corporate Division, Wheel’s Automotive Dealer Supplies Inc.
Scott Pechstein, Vice President of Sales, Autobytel Inc.
For more on these outstanding honorees, see the Sept. 1 issue of Auto Remarketing. In this week's episode, Cherokee Media Group director of meetings and events Marilu McQuilkin stops by to share some important updates on Used Car Week, including registration and agenda information. Plus, get a sneak peek at the conference's sweet digs in Palm Springs, Calif.
All episodes can be found on our Soundcloud page or by visiting www.autoremarketing.com/ar-podcast. Please complete our audience survey; we appreciate your feedback on the show!